The cream masks, mud masks and sheet masks available at Shoppers have different formulas and ingredients specific to different skincare needs to help brighten, nourish, hydrate or refine pores. These items fit easily in toiletry bags and are useful when travelling. Life Brand Facial Masks priced between $1.99 or 3 for $5.00 are available in single size masks would be useful for mini at-home-spa treatment. Life Brand Eye Roller available for $16.99 contains caffeine and pro-vitamin B5 to help decrease the appearance of under-eye puffiness and dark circles. This non-irritating formula helps brighten the skin under the eye and replenish skin's moisture barrier. 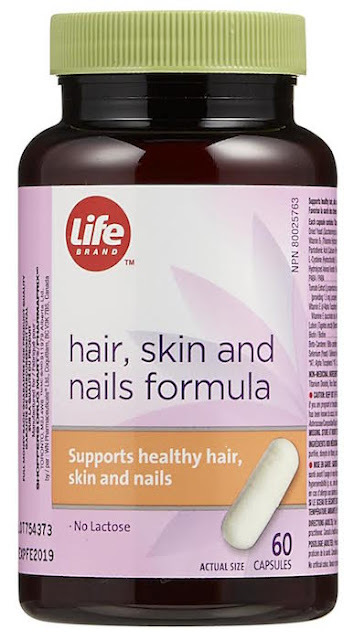 Life Brand Vitamins Hair, Skin and Nails Formula available for $19.99 is a lactose-free supplement with ingredients like Selenium, Biotin, Lutein, Vitamins E and B1 and Beta Carotene that helps healthy hair, skin and nails from the inside. LifeBrand.ca has an online vitamin finder that helps us choose vitamins which will benefit us and are suitable depending on criteria such as our age. 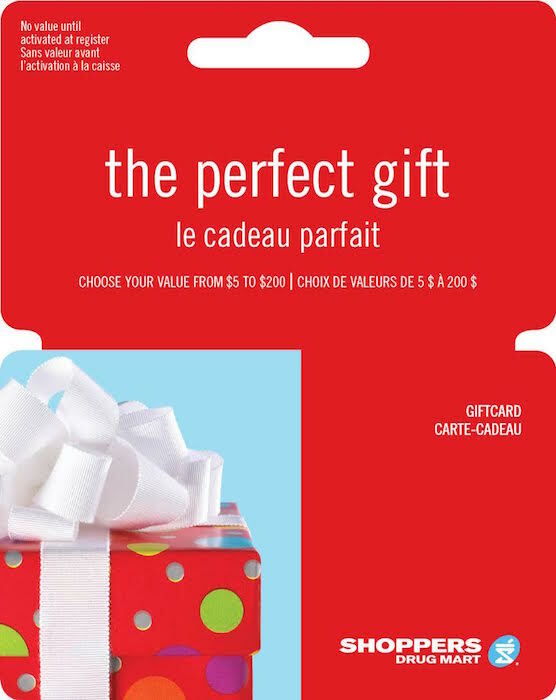 If you are in Canada you can enter to win a $50 gift card from Shoppers Drug Mart so you can shop for your own Life Brand favourites. Enter the giveaway through the rafflecopter below before December 16th. To be eligible to win please leave comments and follow my social media networks. I live in Newfoundland canada. Yes I like life brand products but have never heard of the vitamin finer. I'm from Ontario and use Life brand vitamins and pain relief products. The vitamin finder is something new to me. I am from Manitoba and yes we do use life brand products, i love the vitamins. I live in Ontario and we love Life brand ! we have quite a few of their products. I actually had no idea about the vitamin finder! That sounds very helpful! I'm from Ontario. I use a variety of Life Brand products (vitamins, bubble bath, body lotion). I hadn't heard of the vitamin finder, but will definitely give it a go. I do use life brand products. No I didn't know. Thanks for the chance. I live in Ontario - I love Life Brand products because they are affordable options! I do not know about the vitamin finder though - sounds interesting! I live in BC and use Life Brand Moisturizer! I live in Nova Scotia. Yes I use Life brand products. No I didn't know about the vitamin finder. I'm from Ontario and I love Life Brand products and buy them whenever possible. But I had no idea about the vitamin finder until now. Ontario. and I do use some of the Life Brand Products - they are great! I did not know about the vitamin finder.. I live in Ontario and use Life Brand Vitamins, I did not know about the Vitamin Finder! I live in Nova Scotia and I did not know about the vitamin finder. I live in Saskatchewan. I have not tried Life Brand products and I did not know about the Vitamin Finder. I live in NL and I use Life Brand products. I did not know about the vitamin finder. I don't currently use Life Brand products. I didn't know about the Vitamin Finder. I live in Canada. I use Life Brand Daily-One multivitamins. They are the only ones that don't cause me to feel sick. I've never heard of their vitamin finder before, going to check that out. I'm in Ontario. I do use Life Brand products. I live in Ontario and yes we use Life Brand. I didn't know that there was a Vitamin finder on the Shoppers Drug Mart Website. I am from Nova Scotia and we do use Life brand vitamins and pain relief products. The vitamin finder is new to me. I live in Toronto and buy Life Brand Vitamins regularly. We live in Ontario and use Life Brand products.I dod not know about the citamin finder. I live in Ontario. I do use Life Brand products, especially the allergy medication. I didn't know about the vitamin finder though. Thanks for sharing! I live in Ontario and yes, I use Life brand regularly but I did not know about the vitamin finder. I live in Alberta and I use some Life Brand products. I didn't know about the vitamin finder. I live in BC and have used / use Life Brand products. I did not know about the vitamin finder on LifeBrand.ca. I live in Halifax. Yes, I use a lot of Life Brand products, but I didn't know about the vitamin finder. I live in NB and I use Life Brand products. I'm in Ontario. I do use Life Brand products and I didn't know about the vitamin finder. Do you use Life Brand products? I have used Life Brand products. Did you know about the vitamin finder on LifeBrand.ca? I did not know about the Vitamin finder. I'm from Alberta. I use a variety of Life Brand products and I didn't know about Vitamin Finder. I am from BC. Yes I use Life Brand products but I didn't know about the vitamin finder. I"m in Alberta. I have tried a number of Life Brand Products. I didn't know about the Vitamin Finder. I live in Saskatchewan and I use Life Brand products but have never heard about vitamin finder. 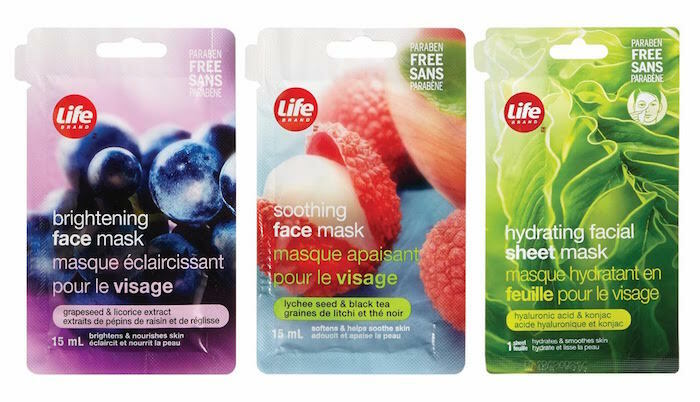 I am in Greater Toronto Area, Ontario and I don't use Life Brand products but would love to try them ... I didn't know about the vitamin finder. I live in Ontario. I buy a wide variety of Life Brand products and they're all high quality. No I didn't know about the vitamin finder. I live in Ontario , I use a lot of life brand products , love them ! I did not know about vitamin finder , but now I do !! I like in Nova Scotia and I often purchase Life Brand products, but I didn't know about the vitamin finder. I live in Ontario and do use Life Brand Products but I didn't know about the Vitamin Finder. From Manitoba. I use life brands vitamin e lotion. I hadn't heard about the vitamin finder before. I live in Saskatchewan and do use Life Brand Products but I don't know about the vitamin finder. I live in Port Coquitlam, and I don't usually use Life Brand and didn't know about the Vitamin Finder. I live in Alberta. I use Life Brand Products. I have not heard of the Vitamin Finder. I live in Ontario and I do love Life Brand Products. I have not heard before of the vitamin finder. I'm from Ontario and I do use Life brands. I have not heard of the Vitamin Finder. I do use Life Brand products. I have not heard of the vitamin finder. i live in BC, and use life products sometimes. Never heard of the vitamin finder though. I live in Alberta and we do use Life brand products but I wasn't aware of a vitaimn finder. Thanks! I live in rural Ontario, and do use Life Brand products. Didn't know about the Vitamin finder. I'm in Alberta and I use many different Life brand products! I have not heard about the vitamin finder, I will have to check it out! I live in BC and we use a few different Life Brand products. I haven't heard of the vitamin finder, but it sounds interesting. I live in Ontario and we often purchase Life Brand products, especially the cold & sinus. I was not aware of the vitamin finder. I live in Ontario and I do use quite a few Life Brand products!! I live in Nova Scotia. I like Life Brand products and use them often. I was not aware of the online vitamin finder. Thanks for letting us know about it. I live in Toronto! I do get various life brand products but did nt know about the vitamin finder. I live in Ontario and regularly buy Life Brands. However I did not know about the Vitamin finder! I live in Ontario, I buy a variety of Life products but had no idea about the vitamin finder. I am in BC and often use Life Brand products. I did not know about the vitamin finder on LifeBrand.ca. I live in ON. I have used life brand vitamins before, but not tried the tool! I am in BC. I regularily use Life Brand Products! have not tried the Finder yet. I did not know about the vitamin finder but I do use Life brand toilet tissue, bandages and flu and cold meds. I am in Calgary. I'm in NB and I do use life brand products. I didn't know about the vitamin finder. Hi,i'm in Newfoundland and yes we use Life Brand products.No,i didn't know about the vitamin finder on LifeBrand.ca. I am in Ontario . I use Life Brand Products but have never heard of the vitamin finder ! I live in Ontario and use Life Brand products all the time. I live in Ontario and use Life Brand products. I have never heard of the vitamin finder. I live in NB. I have used Life Brand Products but this is the first that I have heard of the Vitamin Finder. I live in Ontario and I love the Life brand. But I had not heard of the vitamin finder before. I'm in Toronto, we use some Life Brand products, I did not know about the vitamin finder. i do use life brand! depends on the price point though. I live in Newfoundland! I live in Ontario. I haven't tried any Life Brand products. I did not previously know about the vitamin finder on LifeBrand.ca. I'm in Ontario. I have tried Life Brand Vitamins before but have never heard of the vitamin finder. I live in Saskatchewan. I have tried a few Life Brand products. I did not know about the vitamin finder though. I live in Ontario. I do use Life Brand products but have not heard of the vitamin finder on LifeBrand.Ca. I'm in BC. I do use Life Brand and it's usually Life Brand vitamins that I buy. I live in Ontario and I use the Life brand multivitamins. I live in Ontario. I use life brand products, but haven't heard of the vitamin finder. I'm from Ontario. Yes I've used some life brand products and no I don't know about the vitamin finder on LifeBrand.ca. I am from Alberta. I love using LifeBrand products. No I didn't know about the vitamin finder. I live in Manitoba. I do use Life Brand products and had not heard of the vitamin finder until now. I live in Ontario and we use Life Brand products (bandaids, headache medication etc). I didn't hear about the vitamin finder until now. We live in Ontario. I wasn't aware of the vitamin finder! We've been using Life brand products for many years! I live in Ontario. I've used Life Brand for years! I did not know about the vitamin finder. Cool. I did not know about the Vitamin Finder. I always buy Life Brand products. They are trustworthy and more affordable.